Bainite in steel is an industrially useful structure. However, the controlling factor of its transformation start point is not known clearly. 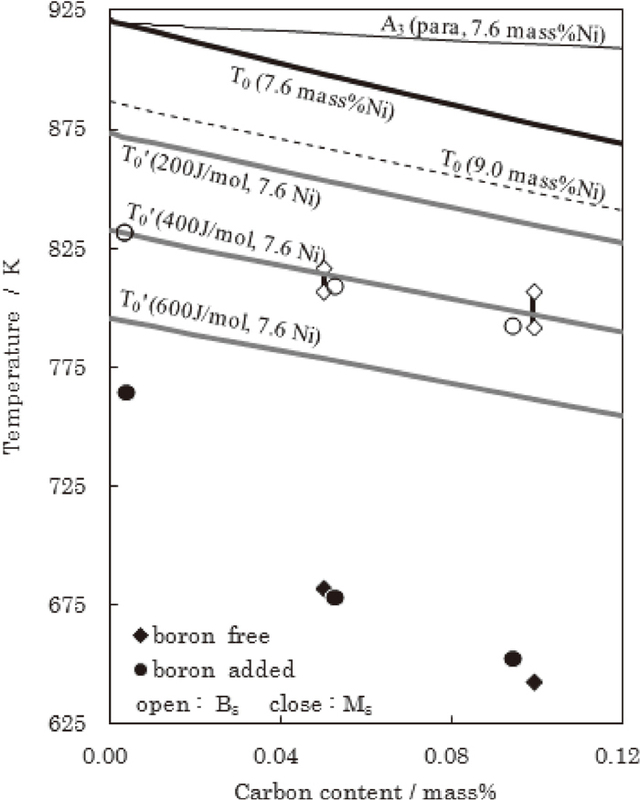 In this study, to clarify the effect of carbon content on the bainite transformation start temperature (Bs), we evaluated the dilatation curve and the microstructure in low carbon Fe–9Ni alloys. As a result, Bs decreased with increasing of carbon content. Furthermore, the driving force of partitionless transformation from fcc to bcc at Bs, which was calculated considering nickel segregation, was approximately constant at 400 J/mol in all alloys. This value is consistent with the driving force required for partitionless growth of ferrite, as reported in a previous study. This consistency suggests that Bs depends on the martensitic growth behavior of lath-shaped ferrite, which is determined by the supercooling starting from the T0 line.